Should I be more appreciative of the important things I’ve got? Tell me just what would I do with a cutesy little teddy bear? And after forty years together dear, I’m pretty sure it’s you! Professionally staffed libraries form part of the fabric of many peoples lives, and are part of the support network which keeps many isolated, depressed, elderly, disabled and lonely people going. Across the UK since 2010, we have seen between 800 and 1,000 libraries closed or handed over to volunteers. We have also seen between 8,000 and 10,000 library workers made redundant. We have a government libraries taskforce, (which Labour also support), which does not take representations from library users, front-line staff, campaigners or union members. We have had three libraries ministers since 2016, and we have had no national standards for libraries since Labour abolished them in 2008. On a local level, in Sheffield we have library PC time restricted to two hours a day, even if people are doing a job search and there is nobody waiting. We have 16 libraries run by volunteers on part-time hours. Even central library is closed on Wednesday morning. 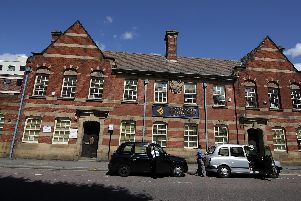 Sheffield’s only Carnegie library has been de-staffed and is set to become a cafe/bar. The council is also allowing our central library to be used to host a libraries taskforce workshop on volunteer libraries. We need a government that values public libraries, which will re-introduce national library standards for England and will seek to reverse the amateurishness of librarianship as a profession. On a local level, we need a council who will come out strongly against volunteer libraries, (which form a key part of the government’s localism agenda), and which will protect listed library buildings from conversion to other uses. I am writing concerning the forthcoming reunion, (April 19), for those who attended Myers Grove between the years of 1964 and 1969, or who then entered the 6th form and left in 1970 or 71. That is, those who will be 65 between last September and this coming August. My email address is oldham.bmary52@outlook.com for contact details. The cost is £30. Here at Ice Station Zebra the joys of daytime TV are somewhat lost to moi. Early episodes of Minder, The Professionals and the Last of the Summer Wine plus Foyle’s War are fine, as well as the occasional Taggart. However, endless appeals from kids’ eyes make me realise how lucky we are, even in this benighted country. What is depressing are the adverts for funeral plans, leaving something for your loved ones. Endless repeats of Only Fools and Horses plus somebody flogging vacuum cleaners and late-night roulette tend to make my eyes glaze over. The appeals regarding the poaching of elephants seem so tragic. I suppose its time to play the theme from Easy Rider and go looking for adventure and limbo into that new bar in the Town Hall Gents’. I really ought to go out more but it’s too cold. I am surprised that Richard Caborn has not been selected as the preferred nomination for the South Yorkshire Mayoral election. He is one of the few local politicians with a track record of achievement at a local and national level. In addition he has the knowledge and skills to negotiate with the many vested interests who will seek to influence what powers the Mayor can exhibit. Perhaps he will consider standing as an Independent Candidate. Imagine my surprise when I opened Saturday’s Star to see my cheeky request actually granted! Please thank Whitworth for his character sketch of everyone from The Steels strip. What an honour! I have cut it out and it has pride of place in my kitchen. Thanks to all at the Star.